Lovely Lovely. Those ruffled feathers are beautiful. Those branches make me think spring. Great photos! i love the ruffled feathers. So sweet..and such exquisite detail in their feathers!! I miss my country birds and will get my fix this weekend at the cottage...love the photos ! All I got last week was hawks and crows. I'm heading out in the milder weather to bird seek. Love them. 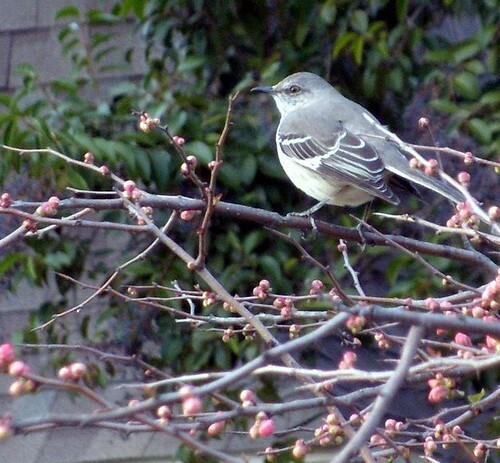 there is something that i just adore about mockingbirds...even though they are supposed to be mean, i just love them. beautiful shots. Well, you know I love my birds! Wonderful shots of this one! Kind of sad to see the wind ruffle its feathers. Seems cold. Birds...kind of like human life. We often get our feathers ruffled but things soon settled down so that we can perch quietly and enjoy life. i love photos of birds. you have captured two lovely ones. Those ruffled feathers are the cutest! What great captures these are, elk! Birds and budding branches -- such signs of spring just around the corner. ELK, they are beautiful, this morning when I opened my back door the tree was full of birds, I knew if I moved they would all fly away so I just stood watching. Have a great weekend. Oh wow they are great images. I love the little fellow with the ruffled feathers. Happy weekend Elk. 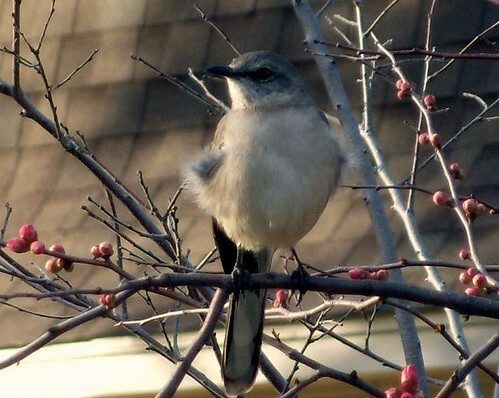 my son says, that's a FAT mockingbird-the FATTEST i've ever seen! The bird is the lesson. Namaste,my sweet friend. GREAT birds n berries! Lovely to capture these two guys sitting in the branches. Nice work! Thanks for sharing these two. Always exciting when I see you have posted new work! Have a great weekend! looks like you'll soon have pretty colours in the garden. ruffled feathers in the breeze is adorable. Beautiful shots...My hubby spied 2 robins on his walk the other day. Very unusual, especially at the beginning of February. Maybe this means spring is coming early this year. love the softness of it's feathers in that first shot...wonderful! loving all the birds I am seeing around on blogs today. dont you just want to cuddle that first one? So sweet, both of them. Great captures. I am a breeze and ruffled feathers sort, except right now, I'll take all the sun I can get. beautiful! what kind of bird is that? so sweet! I especially love the top one, because of that fluff!! You've got a special eye to capture these images.